Aarti Shyamsunder, Alixandra Pollack, and Dnika J. Travis, India Inc: From Intention to Impact (Catalyst, 2015). Aarti Shyamsunder and Nancy M. Carter, High Potentials Under High Pressure in India’s Technology Sector (Catalyst, 2014). Laura Sabattini, Expanding Work-Life Perspectives: Talent Management in India (Catalyst, 2012). How to cite this product: Catalyst, Quick Take: Women in the Workforce—India (July 11, 2018). Population Reference Bureau, “2017 World Population Data Sheet With Focus on Youth” (2017). 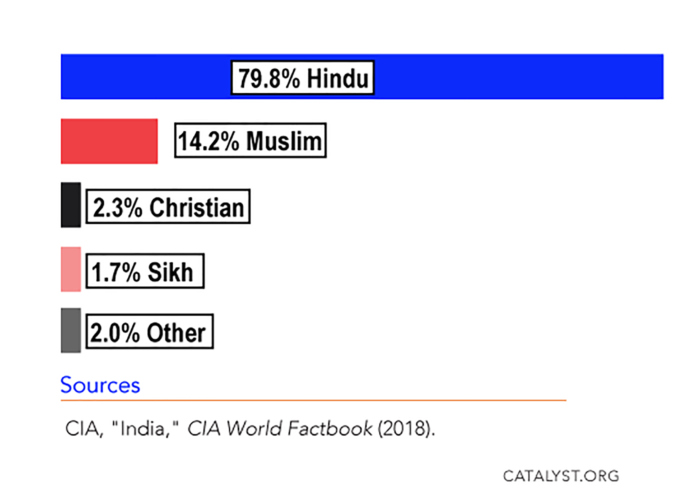 CIA, “India,” The World Factbook (2018). World Economic Forum, The Global Gender Gap Report 2017 (2017). Ministry of Statistics and Programme Implementation, Statistical Year Book India 2017, “Table 2.1 Area and Population by States (Census 2011),” (2017). Aparna Banerji and Amanda Yik, Diversity and Inclusion in Asian Country View: India, Community Business (2012). Donald Johnson and Jean Johnson, “Jati: The Caste System in India,” The Asia Society, August 19, 2008. ILO, India Labour Market Update, July 2017 (August 8, 2017). International Labor Organization, Global Employment Trends for Youth 2017: Paths to a Better Working Future, (2017): p. 45. Jonathan Woetzel, Anu Madgavkar, Rajat Gupta, James Manyika, Kweilin Ellingrud, Shishir Gupta, and Mekala Krishnan, The Power of Parity: Advancing Women’s Equality in India, McKinsey (2015). Vincent Del Giudice and Wei Lu, “India Seen Topping Global Labor Force In Next Decade, Data Show,” Bloomberg (August 31, 2017). Wage Indicator Foundation, Monster Salary Index 2016 Gender Pay Report- Ready Reckoner (2017). Aarti Shyamsunder, Alixandra Pollack and Dnika J. Travis, India Inc.: From Intention to Impact (Catalyst, 2015). Deloitte, Women in the Boardroom: A Global Perspective – Fifth Edition (2017). In this report, we focus on building awareness and offering action steps for developing and advancing women in corporate India.